In Fall of each year we take time to look more closely at the factors driving the success of our #1 ranked CPA network. 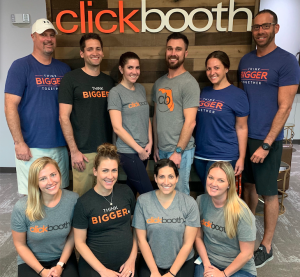 Clickbooth has gone from strength to strength in the Blue Book survey over the last three years, outperforming other large networks in support from advertisers while also receiving an increasing publisher share-of-vote. We spoke to four of the most successful affiliates we know to find out why Clickbooth is their CPA network of choice. Clickbooth’s platform development over the last few years has won a lot of plaudits from the Blue Book response panel. We spoke to publishers representing a cross-section of the industry – everything from lead-gen to health and beauty, and from dating to financial services – to get a feel for how they’re using the platform and the benefits they are seeing. ”Clickbooth’s technology is great. We use their offer groups capability constantly – it makes switching offers easy. And their reporting is fantastic – it is really simple to use and accessible. It makes such a difference,” – John Blazevic. “I think the quality of offers available on a network is important and Clickbooth goes the extra yard to get exclusives. It makes a difference. One time with another network I was running a dating offer and it just suddenly shut down. Then the alternative offer they had wouldn’t convert. I had to start from scratch which just took so much time and cost me money. I haven’t seen that happen with Clickbooth at all” – Billy Burke. An increasing trend we have seen emerging from Blue Book survey comments over the last three years is the importance of publisher support from their network partner(s). Whether it is tech support, guidance on what works or simple encouragement, every single affiliate we spoke to raised network support and service as a key factor in choosing to send traffic to Clickbooth. It is hard to do better than leave the final word to one of the smartest publishers in the business, Billy Burke, who boils down his experience to two key sentences. The publishers we spoke to for this article have worked with over a dozen different networks at various times and in each case they have moved either all of their business or a significant percentage of it to Clickbooth. As we discussed why, the reasons became clear: Clickbooth’s rapid investment in their platform technology in the last three years has paid dividends in terms of ease of use and ROI. At the same time the offers available are rated very highly which reflects well on the network’s advertiser relationships, and there is unanimous praise for Clickbooth’s affiliate managers and publisher support. CPA networks operate in a crowded and very competitive environment, and for Clickbooth to be ranked #1 by the Blue Book shows that they are doing many things very well indeed. The performance marketing industry is trending in the direction of networks that are larger, very professional and well-financed, and Clickbooth is leading the pack.